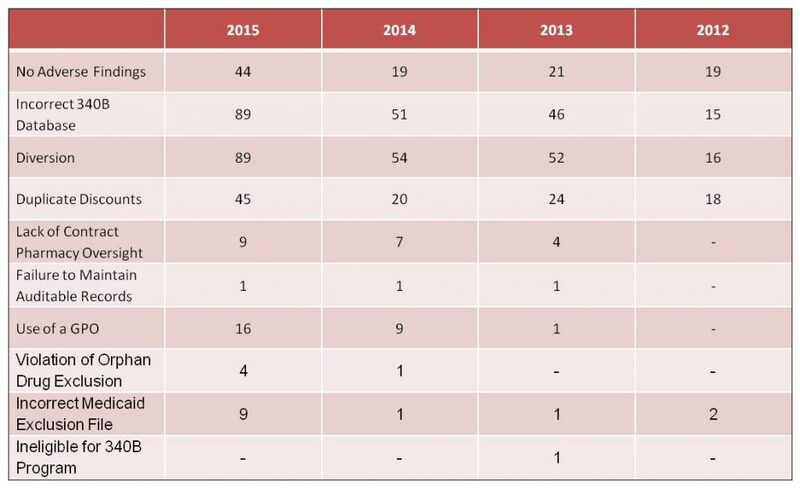 The HRSA has completed 434 audits of Covered Entities between the years 2012 to 2015. Initially, HRSA endeavored to conduct “selective and targeted” audits of 340B covered entities to provide additional program oversight, monitor for program violations and prevent diversion and duplicate discounts. The selective audits are centered on risk-based factors including the number of outpatient facilities, number of contract pharmacies, the complexity of a Covered Entity’s 340B program and the volume of 340B purchases. Targeted audits are focused on specific violations and/or allegations of noncompliance. Through the proposed fiscal year 2016 federal budget, additional funding will be allocated to program integrity and increasing the reach of the HRSA audit process, with intent to target at least 300 Covered Entities in fiscal year 2016. As of March 31, 2016, 23 audits have been completed by HRSA, with many more currently in process. As illustrated, the most commonly audited Covered Entities are DSH hospitals, CHCs and Critical Access Hospitals. Together, these facilities total approximately 82% of the audits conducted by HRSA. However, as of 2016, these facilities represent approximately 69% of Covered Entities (including Child Sites) listed on the HRSA 340B database. What this appears to illustrate is that these types of Covered Entities may be more likely to be subject to a selective audit, based on the Child Sites, Contract Pharmacies, complexity of operations and (presumably) purchase volumes, in accordance with the criteria established by HRSA. It should further be noted that of the audits of Covered Entities with Contract Pharmacies, approximately 82% of the Covered Entities had 6 or more Contract Pharmacies servicing the 340B patient base. In instances of Diversion and Duplicate Discounts, repayment to manufacturers was the most common sanction imposed on Covered Entities. Other significant sanctions included the removal of contract pharmacies and/or child sites from the 340B program. In at least three instances, a Covered Entity has been removed from the 340B Program. In addition to a robust internal audit/compliance program, Covered Entities are encouraged to engage an independent party to perform an audit of your 340B program. 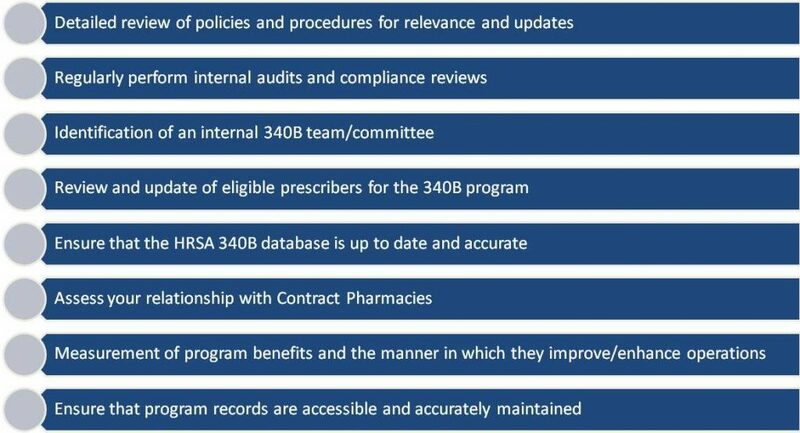 Also, the Mega Guidance is proposing standards to incorporate annual audits and quarterly reviews of contract pharmacy relationships. For more information about HRSA Audit Compliance and how to be prepared, please visit our website at www.StoneBridgeBP.com or contact us at info@StoneBridgeBP.com or 888.247.9764.